Just popping by to bring you this week's photos from The August Break 2014 that I'm participating in this summer. 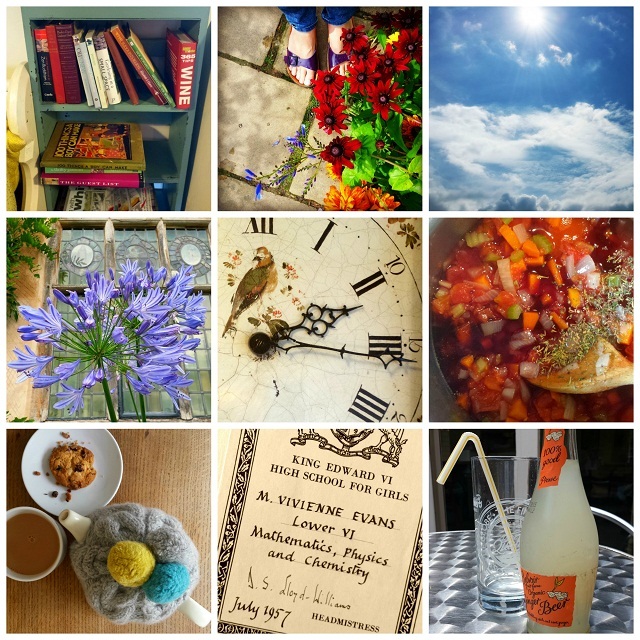 I like them displayed as a collage as I can see rhythm and links between the photos and between these mid August days: mellow moments, an appreciation of time gone by, the beauty of the summer and, of course, lots of foodie treats. ♥ Drink. My favourite (non-alcoholic) drink of the summer is ginger beer. ♥ Handwriting. Beautiful writing in a beautiful book of Dylan Thomas' poetry. ♥ On my table. Tea in a pot, biscuits and pretty crumbs. One cup is not always enough. ♥ Guilty pleasure. A splash of wine in the pot and a glass for me. Has to be red. ♥ Hands. My parents own this magnificent clock that previously belonged to my grandparents and was made by a local clock maker. ♥ Blue (picture 1). Luscious blue agapanthus at Packwood House, Warwickshire. I love the planting at this National Trust property - my third visit this year. ♥ Blue (picture 2). A perfect summer sky on Friday. ♥ Look down. My happy feet at Packwood House. ♥ Book shelf. I don't own many books anymore but I adore seeing interesting collections of books. Yesterday, after a walk, we visited a favourite vintage cafe; luxury mocha and lemon drizzle cake made the visit complete. Thank you for reading, commenting and following here this week. I'm hoping to update you on my minimalist wardrobe this week. Today I think I've done my last car boot sale and my last major clothes drop off at our local charity shop. It wasn't much fun holding onto a swaying clothes rail in the wind for several hours - I would have happily let them all fly away - but we made some money to help my son out with a trip next summer and it's good to see unwanted clothes finding new owners. You seem very content with your minimalist life- you are very encouraging. Today I chucked out some books, cushions and kitchen stuff. It's allllll about ginger beer, if only we could always have the perfect english summer to match it! Week 2 of August Break looks very colourful. Look forward to seeing your upcoming wardrobe post. I have been looking at your previous ones for inspiration. I must remember to dress for my real lifestyle and not an imaginary one.